I can’t tell you how good this book was (but I will try!). I’ve never read a book by Ellen Hopkins before, and this was excellent! I will definitely read her other books! I’ve also never read a book in this format before, meaning, a book in poem. At first I kind of struggled with it and I had to get used to the way the text looked on the page (I know, weird) but after awhile I just flowed through the book. There’s this huge misconception that poems should rhyme, and this is one of those books that break that stereotype. The poems don’t rhyme, but it creates a beautiful story about 5 teens. So, the 5 teens are all going through an assortment of problems and throughout the story some will meet each other, which is actually kind of cool the way that you can see how all of them intertwine. 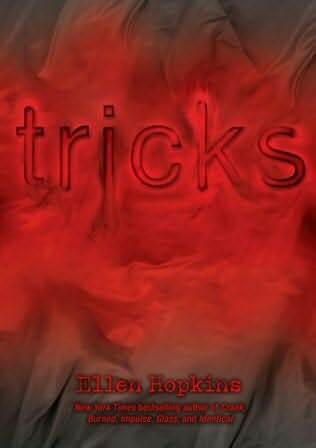 This book specifically deals with the problems of teen prostitution. I didn’t know what a horrible problem this really was until I read this book. I think it does a great job of spreading awareness about tough issues that people don’t really want to talk about. I would definitely say this is for older kids and kids who are at least in high school, because there was some stuff in here that even I was a little shocked by and once or twice I thought, “Wow, should I be reading this?”. But then I realized something. Every teenager should read this book to help prevent the stuff that happens in here, from happening out there in the real world. It’s scary to think about, and even scarier to think that that could be you or one of your friends. It was really eye-opening I think. Parents may not want anyone to read this book, and I can see why, but at the same time I think teens should so they know of stuff that really happens outside of their own little perfect bubble. Life is not perfect and neither is anyone living in it and I hope that many people will read this to spread awareness and help prevent teen prostitution. Let’s just say this: it’s worse than you think. Read this book. Find out.